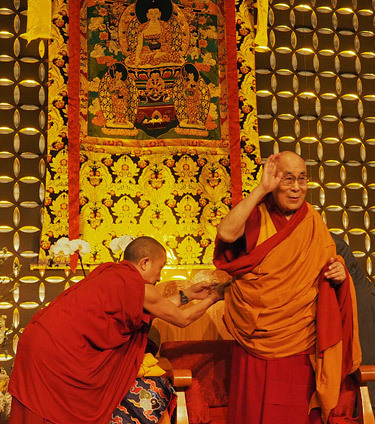 Boston, MA, USA – On a bright and breezy morning His Holiness the Dalai Lama drove across Boston today to address a gathering of 2000 Tibetans from the city and up and down the east coast. Backstage he met and comforted the elderly and infirm. “I’m here to meet Richie Davidson, so the opportunity arose also to meet all of you. Like Tibetans everywhere, you are keeping the spirit of Tibet alive. We’ve been in exile 58 years. In India we have the CTA. Major monasteries have been re-established and are thriving. Tibetans in exile are scattered all over the world, but wherever we are we form local communities, as you have done here, to preserve our identity and traditions. Those who live in free countries outside Tibet have a responsibility to keep up our spirits to encourage our brothers and sisters in Tibet who remain impressively determined. “In the face of restrictions on education in Tibetan, their spirit remains strong. But they are not free to do what they want. There is discrimination when Tibetans’ loyalty to their community is regarded with suspicion and labelled splittist, while Chinese loyalty to their community is praised. There needs to be equality. 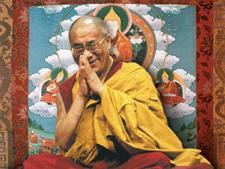 His Holiness recalled that in 1959 nobody knew what would happen to Tibetans who had become refugees. The priority was finding ways to survive and the Government of India were generous with their help. “There was a time when Tibetan Buddhism was dismissed as Lamaism as if it was not a proper Buddhist tradition,” His Holiness remarked. “Since we came into exile we have been able to show that it is in fact a pure and complete form of Buddhism. The tradition handed down to us from Nalanda includes profound philosophy and logic, as well as a rich understanding of the workings of the mind and emotions. We have kept this alive for more than 1000 years and now are in a position to draw from it to make a positive contribution to the well-being of humanity. “Lately in India I’ve been urging people to study, to develop a sound understanding not content to rely only on faith. In monasteries and nunneries from Ladakh to Arunachal Pradesh efforts are being made to study. It’s on this basis that Buddhism will last for centuries to come. China was historically a Buddhist country following the Nalanda tradition as we do. What the Chinese lacked was the command of logic and epistemology that we have maintained and a corresponding path of rigorous study. “In 7th century, Thönmi Sambhota devised a Tibetan script or improved on what already existed taking the Indian alphabet as a model. In 8th century, Trisong Detsen turned not to China, but to India to invite Shantarakshita to Tibet. Right from the start, he, and following him, his student Kamalashila, established the importance of employing logic and reason. It’s because of this that over the last more than 30 years we have been able to hold fruitful conversations with modern scientists. Scepticism about the mind’s being any more than a function of the brain has given way to an acknowledgment of neuroplasticity, recognition that developing the mind can change the brain. May I achieve Buddhahood to benefit all wandering beings. After that he gave the transmission of the mantras of the Buddha, Avalokiteshvara, Manjushri, Arya Tara, Hayagriva and so forth and encouraged those gathered to make their lives meaningful. His Holiness mentioned that in 2015 his physicians found indications of prostate cancer and decided to give him focused radiation treatment instead of surgery last year. This year his recent check-up at the Mayo Clinic has revealed all traces have gone. His Holiness declared that he’s physically healthy, mentally sharp and sleeps well. After lunch His Holiness joined his old friend and Professor of Psychology and Psychiatry, Richie Davidson and business leaders discussing human well-being. He told them that it’s basic human nature to be warm-hearted because our lives depend on having a sense of care for others. But the pressing reason for exploring well-being today is that we find ourselves facing problems that are prompted by anger, self-centredness and intolerance. “We are all endowed with a biological seed of compassion, but we have to nurture it with intelligence. If we don’t change direction, this century will end up like the one that went before overwhelmed by intimidation, violence and bloodshed. Nobody wants that. Early tomorrow, His Holiness will fly from Boston to Frankfurt; the first leg of his journey back to India.